Working in the world of glitz and glamour is a dream come true. After all, you’re rubbing elbows with the biggest A-list stars! But when you’ve become so deeply engulfed in this world, you can become desensitized to larger world issues, like poverty. 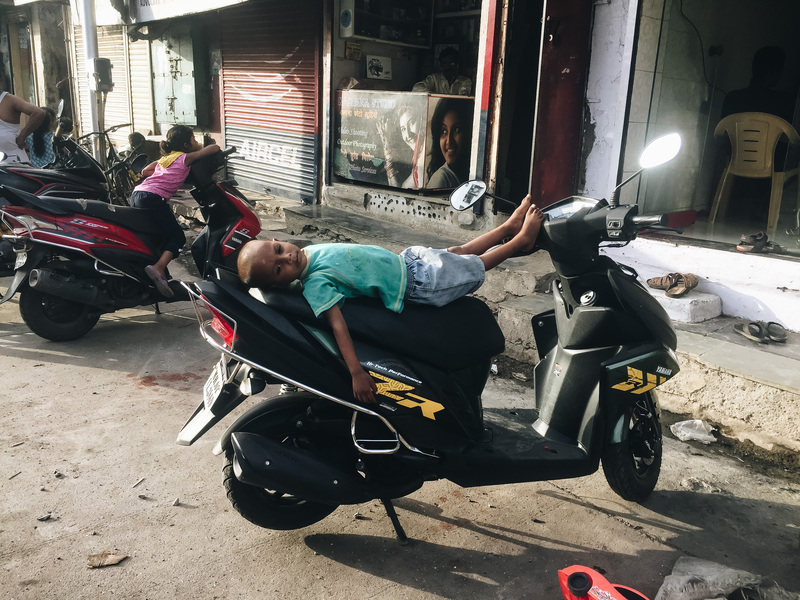 India is known as the “King of Contrasts” and for my experience, that couldn’t be any truer. Just last night, I was partying it up at the the JW Marriott in Juhu for the exclusive GQ Best Dressed function. Today, I was brought back down to earth by visiting Mumbai’s Dharavi Slums, known as “The Heart of Mumbai”. 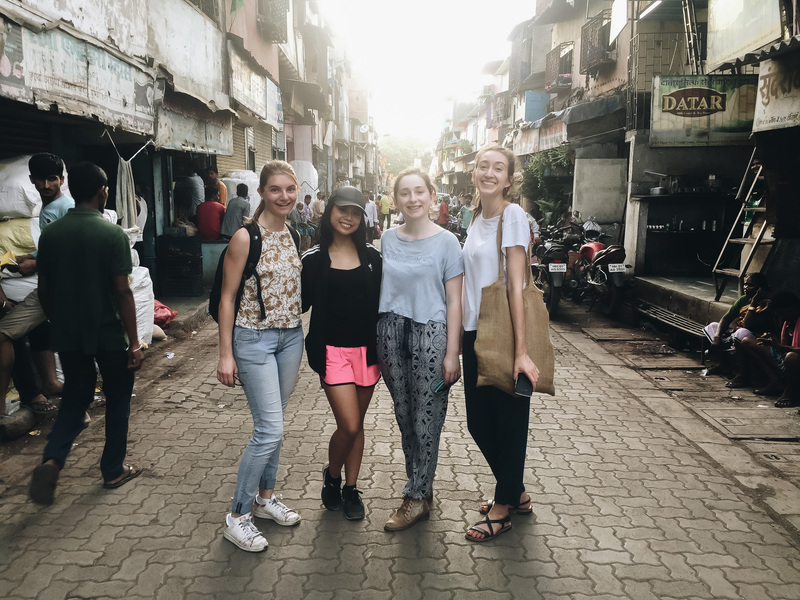 Manoeuvring through the narrow streets of Dharavi was quite the challenge! And the difficulty doesn’t stop there. Our “tour guide”, Kample, invited us over to his home where we climbed up a narrow shaft and sat in a room barely enough to hold his family of seven, never mind us! There, we were offered chai along with banana chips and dhokla. A question for my Indian readers: Is it just a formality to be offered water, tea, or coffee upon entering a household? Or is it seen as rude to decline? 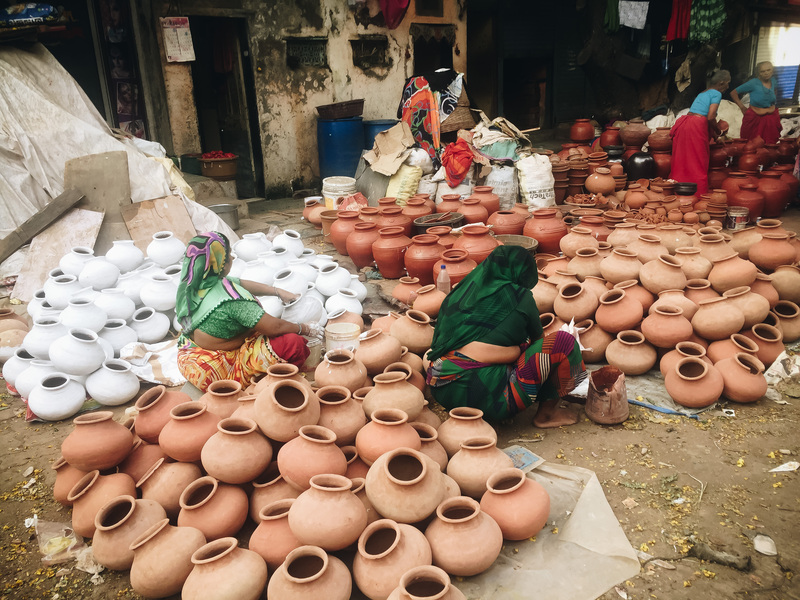 The women painting handcrafted pots on the street. 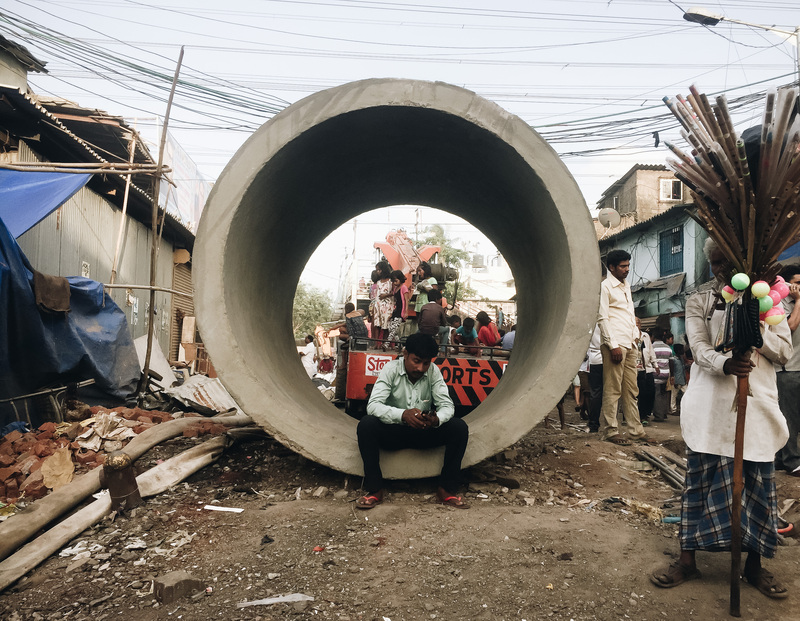 I was surprised by the amount of industrial activity occurring within the Dharavi slums! Pictured above is a man melting iron. 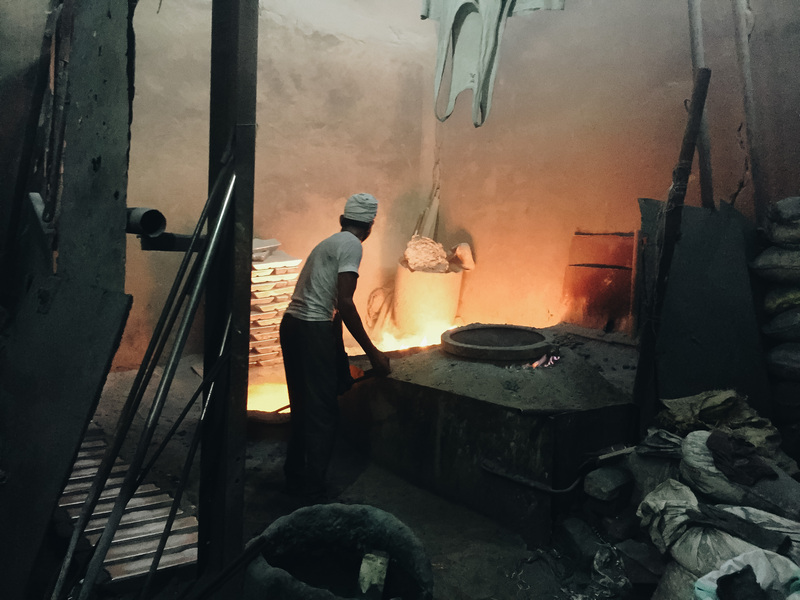 We also saw labourers melting plastic and creating paper sheets. In the first world, we always talk about how the issue of cheap labour and how companies exploit workers in developing nations. It’s almost become a norm that we’ve accepted, as opposed to a problem we should actively attempt to change. It’s so eye-opening how hard these people work for almost nothing. And because I’ve developed a dangerous coping mechanism of hiding my discomfort with awful Internet humour, I uploaded this same photo to my Instagram story with the caption, “Just dropped my mixtape! (fire emoji)” I kinda regret it now, but you have to admit, it was pretty funny. Remember in this blog post when I said that the animals on the road have become a norm for me? They’re too cute. They will always be a delightful sight for sore eyes. 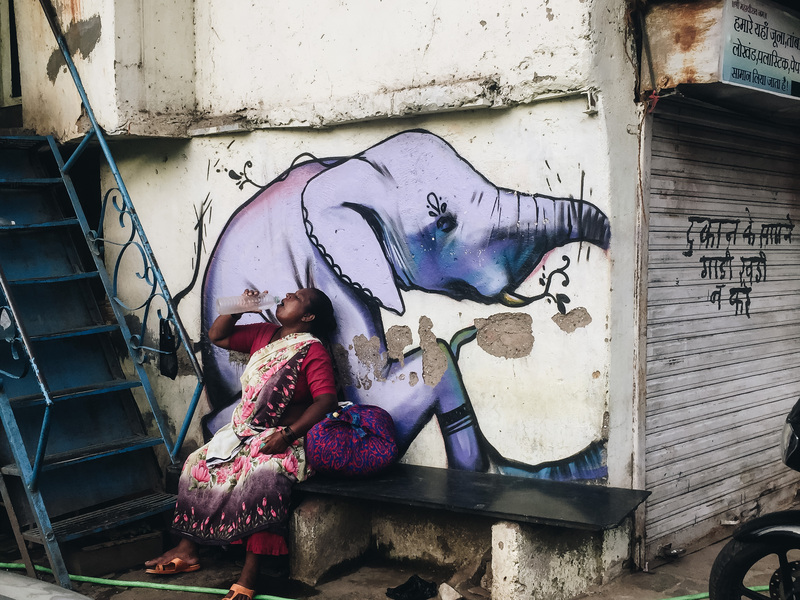 My favourite shot from this day: An aunty savouring the last sips of her water bottle, draped in a sari complementing the grungy street art elephant behind her. One thing you’ll notice about buildings in Mumbai is how much character they have! 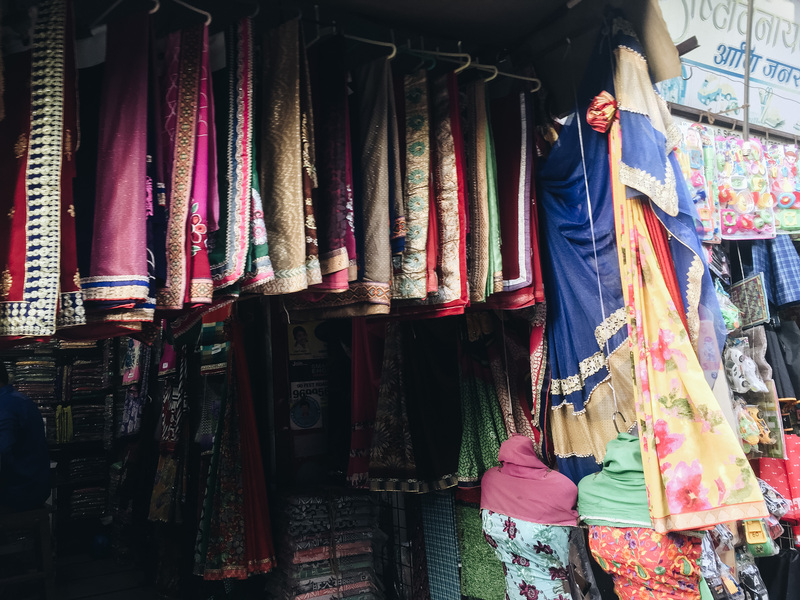 Either the walls are draped in bright lights for a wedding or painted with colours reminiscent of Holi – the slums or elsewhere. 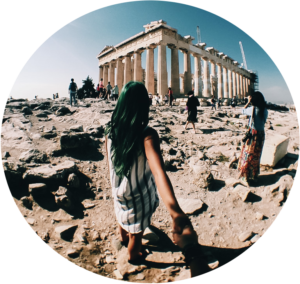 As a shameless tourist and an even more shameless blogger, I sometimes get carried away with the whole “OMG, I gotta document this for my blog” mentality. In places like the slums, I’ll admit that it is disrespectful to take photos of the locals without permission. 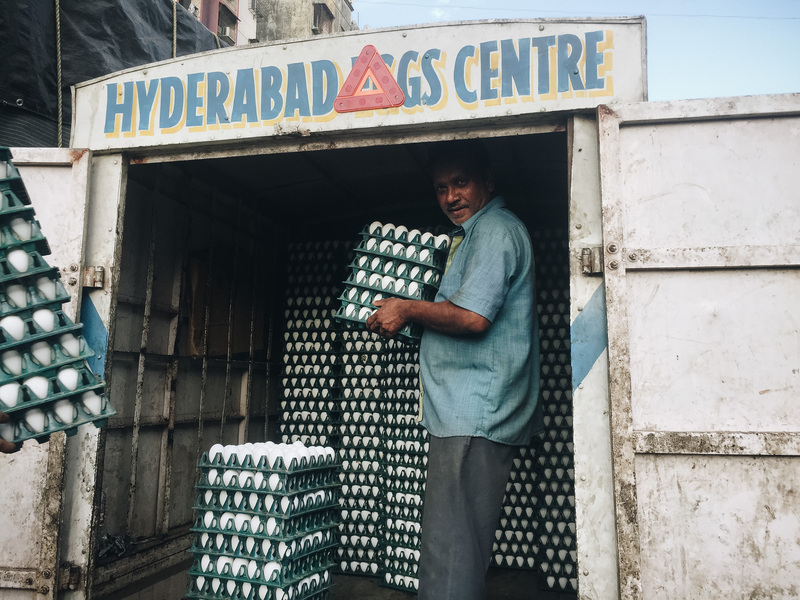 Luckily, this eggwala was super proud to show off. He was so extra for the camera – I loved it! Hands up if you love Indian ethnic wear! 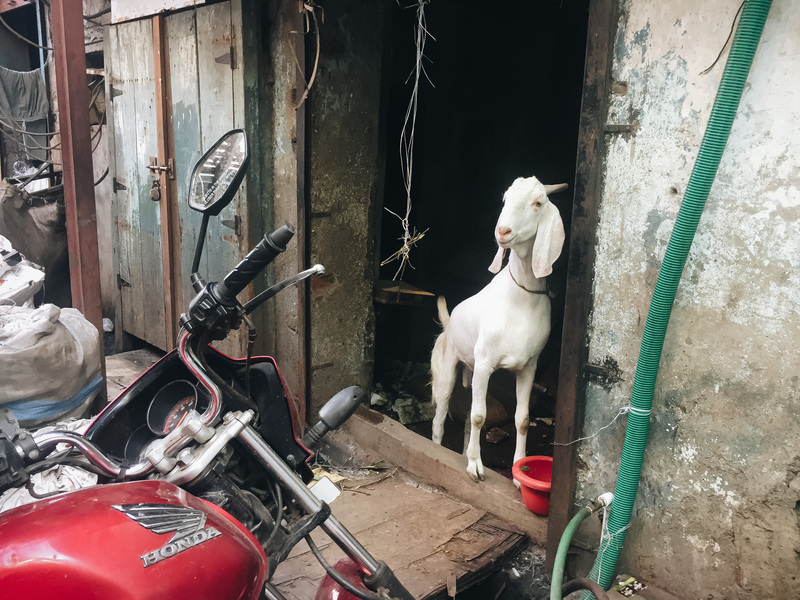 One thing that I’ve noted is that the Dharavi slums were not at all very different from the others I’ve seen in other areas of Bombay. 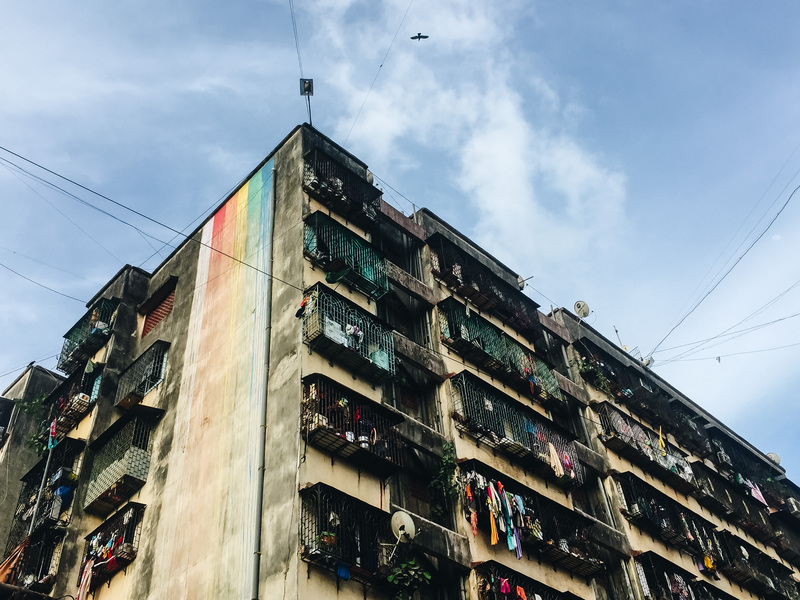 Even in “posh” areas such as Powai and Bandra, you will see communities similar to the one depicted above. Had I not known that it was a tourist destination, I honestly would’ve thought it was just a regular street in the city! If you missed my Insta story on my slum visit, that’s okay! 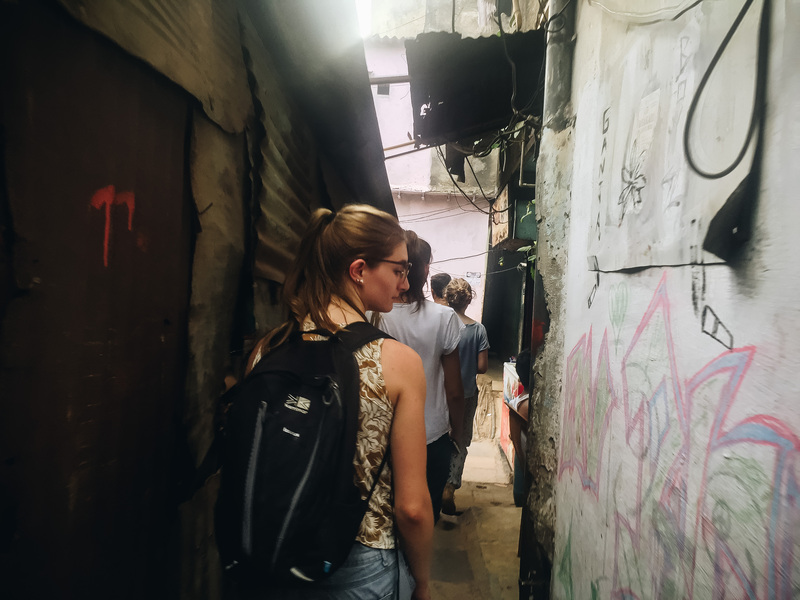 I’ll continue to document my experience in India on Facebook, Twitter, Instagram, and Snapchat!